The national tour continues in support of his sixth album, which was released Friday. 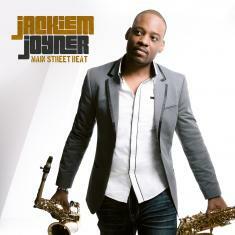 SHERMAN OAKS (30 June 2017): Jackiem Joyner has spent a lot of time on airplanes this month to pave the way for the arrival of his sixth album, "Main Street Beat," a steamrolling sax set that was released Friday by Artistry Music/Mack Avenue Records. Jetting back and forth from his suburban Los Angeles base, Joyner is taking the album he produced, boasting nine of his original compositions, directly to audiences in all parts of the U.S. so they can dance with him to the funky new tracks that reflect his ardor and appreciation for the Motown sound while celebrating his joy of becoming a father. The "Main Street Beat" concert trek began close to home in nearby Pasadena in early June before taking flight for shows in major cities, including Cincinnati, Birmingham, San Diego and Philadelphia. Fireworks will be flying in front of an anticipated crowd of 40,000 when Joyner hits the stage at a Fourth of July event presented by Los Angeles urban radio station KJLH. He will fly back east again to play Akron, Ohio's BLU Jazz+ on July 7 and resume the busy coast-to-coast travel for a run of August concerts. A high-energy set showcasing Joyner's impassioned horn play on tenor, soprano and alto sax, "Main Street Beat" was originally intended to be a funk record, but became more with R&B, contemporary jazz and pop nuances seeping into the mix. The grooves - many of which are infused with the soul power of a muscular sax section laid down in layers by Joyner - are undeniably danceable while his innate flair for crafting catchy hooks and buoyant melodies are prominent in the new material he penned for the project. Aptly, Joyner selected a pair of tunes to record that embody these elements: Justin Timberlake's euphoric "Can't Stop The Feeling" and Bruno Mars' old-school party jam "Treasure." Guesting on the album are a pair of noteworthy guitarists: Steve Oliver, who appears on the first single named for Joyner's daughter, "Trinity," and Chicago hitman Nick Colionne, who strums his electric jazz guitar with trademark panache on "When You Smile." For more information, including Joyner's concert itinerary, please visit www.JackiemJoyner.com.